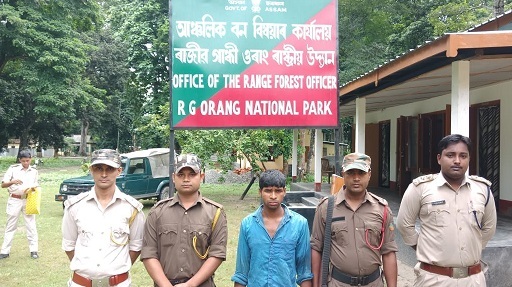 The forest protection force personnel in the Orang National Park and Tiger Reserve Project on Tuesday apprehended one person in connection with illegal catching of a rare variety of ornamental fish within the territory of the Park in the Bogoribari boundary. 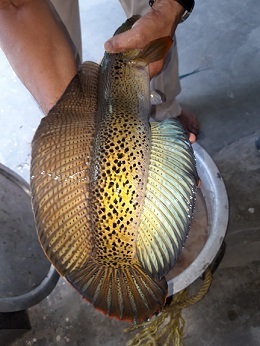 According to Chakrapani Rai, range officer of Orang National Park, a resident of the adjacent Bogoribari village, identified as Jiabur Rahman, illegally entered into the park to catch a rare species of an ornamental fish called ‘Channan Barca’, locally known as ‘Barca Cheng’. One ‘Barca Cheng’ fish, weighing around one kilogram, has also been recovered from the accused. During preliminary interrogation, accused Jiabur revealed before the forest personnel that such fish variety has a huge demand as an aquarium fish in the market and they get an amount of nearly Rs 10,000 for each of such fish weighing just around one hundred gram. Meanwhile, range officer Rai while talking to Northeast Now over the telephone admitted that a smuggling racket has been actively operating surrounding the national park and further informed about identifying the racket dealing with this rare amphibian species. Rai also expressed his confidence of busting the racket within a short time.